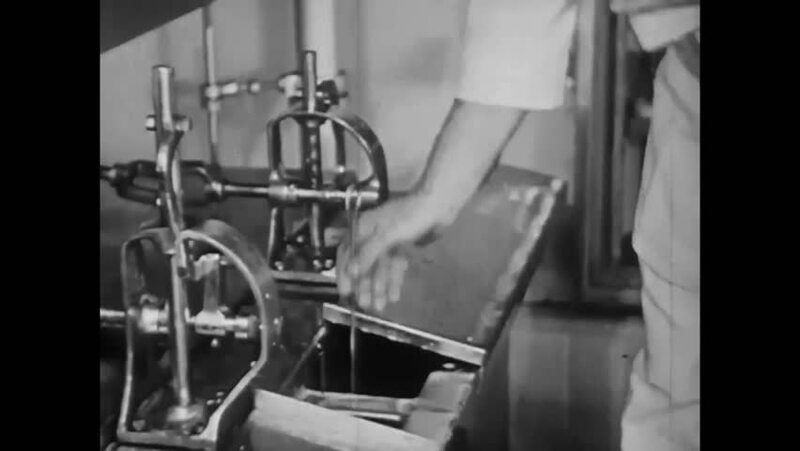 CIRCA 1920 - At a dairy receiving plant, samples are taken from milk to determine its butter fat content and bacteria count. hd00:55CIRCA 1930s - A shower curtain, outdoor furniture and a smoking jacket with a metallic finish are made with flexible resinoid fabrics produced in a factory, in 1937.
hd00:55CIRCA 1930s - A shower curtain, outdoor furniture and a smoking jacket with a metallic finish are made with flexible resinoid fabrics produced. hd00:30CIRCA 1940s - A semiskilled worker operates a moving drill press and wing spars are drilled on a Martin B-26 Marauder.